Llanwrtyd Wells, the smallest town in Great Britain, lies in the Irfon Valley surrounded by the Cambrian mountains and Myndd Epynt. The Irfon river is a tributary of the Wye joining it at Builth Wells, some 12 miles distant. 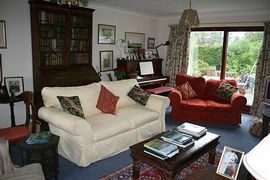 Our B&B is a small estabishment with lovely views and a pleasant garden; the house is comfortable having recently undergone a major refurbishment. 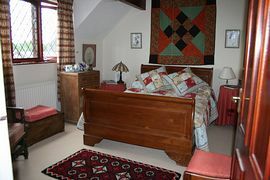 It comprises a double bedroom with sleigh bed, colour TV, hairdryer and hospitality tray, with a separate bathroom for the exclusive use of guests. 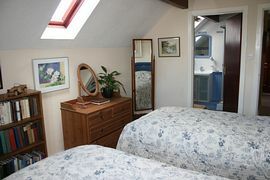 Also a twin bedded room with en-suite shower room and similar facilities. Our breakfasts are ample with an emphasis on quality, using locally sourced foods. We have our own honey and jam, free range eggs from our own hens and we bake our own bread. We will also provide good packed lunches at a moderate cost. We have ample room for secure parking and are only a few minutes walk from the centre of town with its variety of good pubs and restaurants. Llanwrtyd Wells hosts a series of unusual and very popular events throughout the year including Man v Horse Marathon and Bog Snorkelling - see www.green-events.co.uk; it is an ideal base for walking, riding, mountain biking, birdwatching and fishing to name but a few. A small family home where nothing is too much trouble. Pet Facilities: Pets are allowed. We are dog lovers and welcome well behaved dogs but not in bedrooms. Smoking Facilities: Smoking is not allowed. Allowed in the garden. Turn left opposite the garage into Ffos Road. Up the hill and take the first left turn into Erw Haf. Take the second turning (a small track)beside a vacant, overgrown plot, and we are on the left at the top. £55.00 per room per night. £65 per room per night for The Royal Welsh Show. 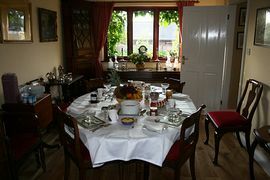 £50 per room per night for a stay of more than 3 nights. 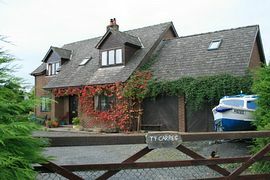 £45 per room per night for a stay of one week. Children under 10 years half price. "Thank you for the warm welcome, comfortable bed and delicious breakfast. We've had a great weekend." "Many thanks for the very warm welcome, comfy bed. We'll be back."